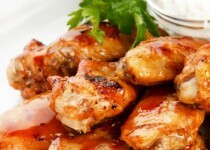 Spicy Jamaican jerk seasoning and served with a fruity, refreshing Ontario grown garlic & peach dipping sauce. 1. Preheat oven to 425F (225c). Line a large baking sheet with oiled foil. 2. Pulse Peach & Garlic Salsa, olive oil & lime juice in a food processor until smooth. Stir in cilantro and set aside. 3. Toss wings with remaining ingredients. Spread out on baking sheet and roast, turning once, until golden brown and crisp, 30-40 minutes. Serve with dip. NOTE: for creamy dip (or to cut the heat) fold in yogurt before serving.